The best place to start, before purchasing filing cabinets, bookcases and other furnishings is to create a plan for your space. If this space is part of an upcoming renovation take advantage of the professional help available to ask questions and get insight if necessary. If your office space is limited to one wall, options for keeping it tidy include a wall unit of shelves with cupboard doors in a style that complements the rest of the room. 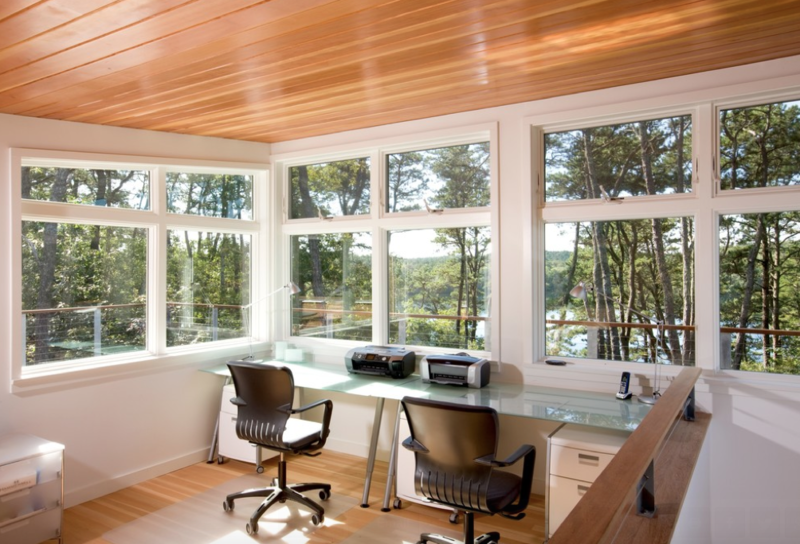 An abundance of windows will let natural light in but just make sure to orient screens in such a way as to avoid having to deal with reflections and glare! A lovely corner for two…twice as nice! 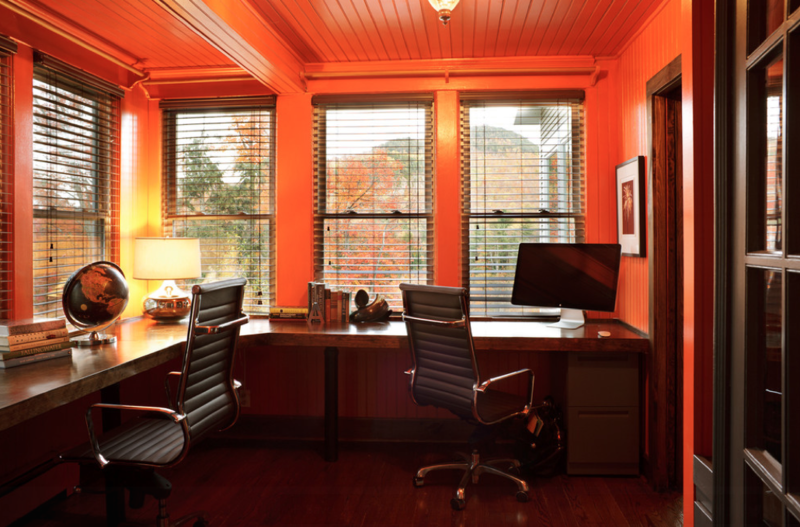 If you are both on the same wavelength and enjoy colors that radiate energy, why not go for a stimulating bright orange wall color that will bring warmth into the room even on overcast days. The corner desk takes advantage of the dynamic! Elegant in its simplicity the the partners’ desk in a white room with muted accents is simple yet functional and when combined with a really special light fixture to personalize the space there really is no equal! If your space is large enough, why not place the desks at opposite ends of the room with a cozy, shared reading nook in between? 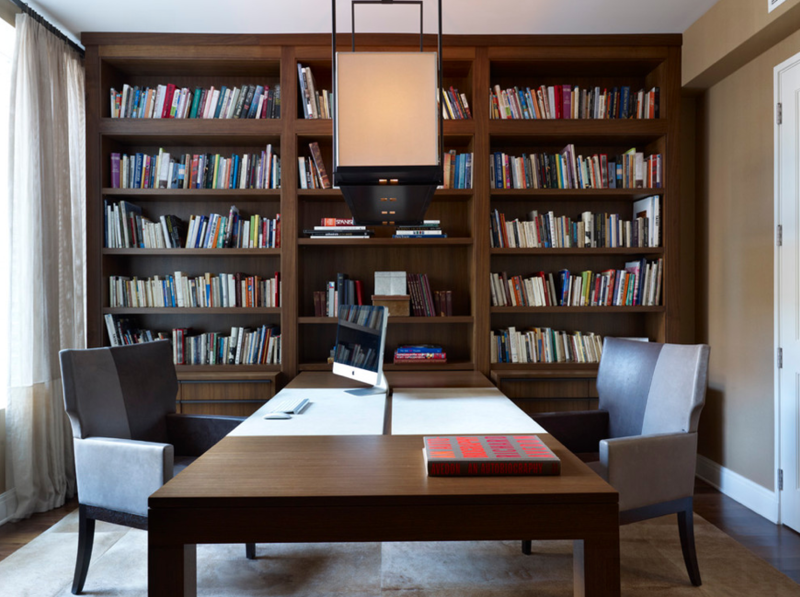 Track lighting above and ample shelves all around with abundant fenestration give the space enough light to enhance concentration. Optimize space with one desk to leave more place for storage and shelving to keep things tidy and out of site when not needed. An added bonus in the enhanced communication and exchange of ideas afforded by working face to face. Discretely placed holes in the desk top will provide for the electrical connections necessary to plug in computers. 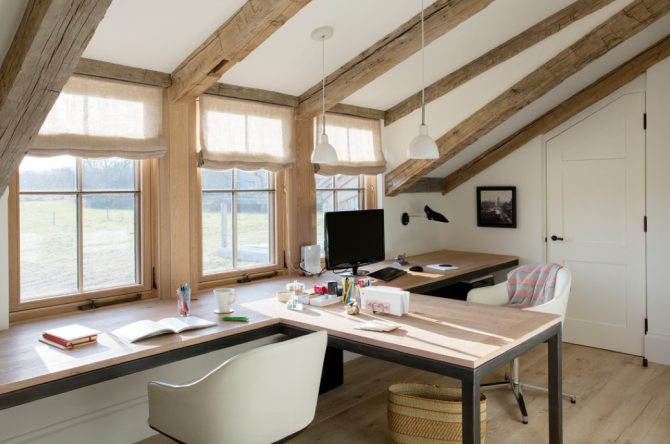 Why not devote your attic entirely to the home office? It’s the perfect place for enhanced concentration, away from the action in the rest of the house and one benefit of using the whole attic for an office is the amount of storage space that’s available or even for a powder room and a reading corner. 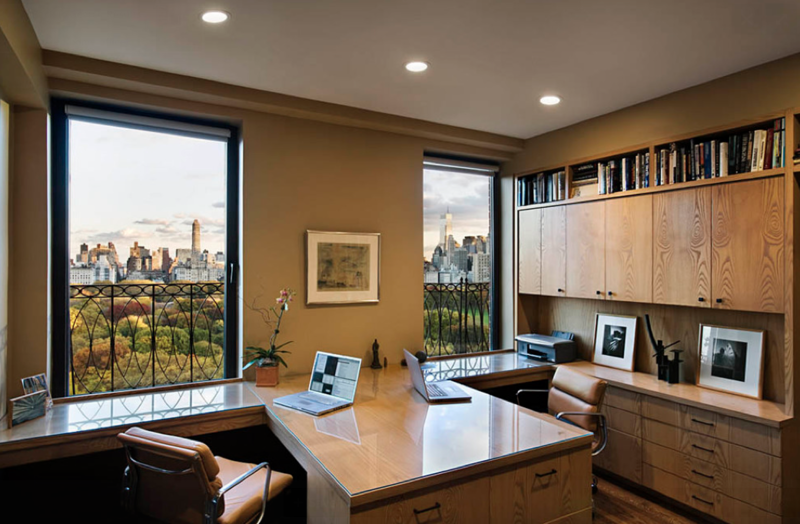 This picture shows how well the natural wood tones blend in with the scenery outside the third floor windows. 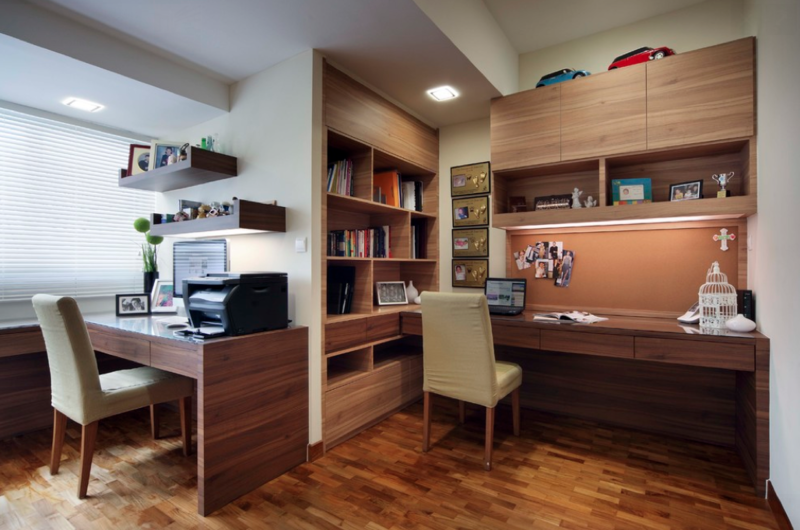 If you like a change once in a while why not use this concept for your home office space? The built ins along the wall offer ample storage space and the separate desk or table that can be changed to fit a new decor or moved to a different location or changed altogether as the mood strikes! By sticking to neutral shades your space will be more flexible and you will probably not tire of it as quickly. 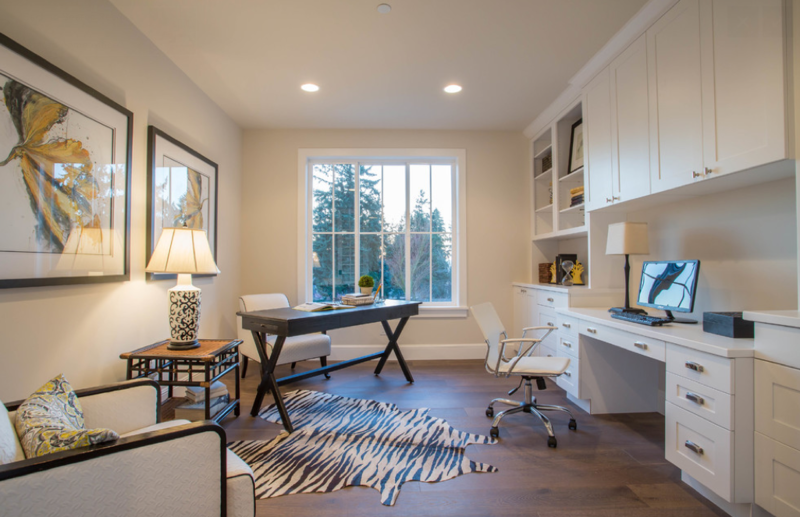 Although working side by side is out of the question in this kind of space there is an advantage to be had by creating separate areas within the same home office. Enhanced concentration is just one benefit and a shared storage unit can be slipped in between the two work stations. Bookshelves to show off your library! If the look of filing cabinet just doesn’t appeal to you why not integrate this essential element into the bookcase to make the space functional as well as elegant? Finish up the office with a partners’ desk and perhaps a reading corner and you’re ready for anything! If you don’t have the luxury of a separate room you can improvise by doing this kind of back to back grouping can be fit into the smallest of spaces whether at the end of a hallway, a nook in the basement or even in a corner of the kitchen/dining area. A well thought out and functional design can make even the tiniest of spaces perfect for a quiet office space. 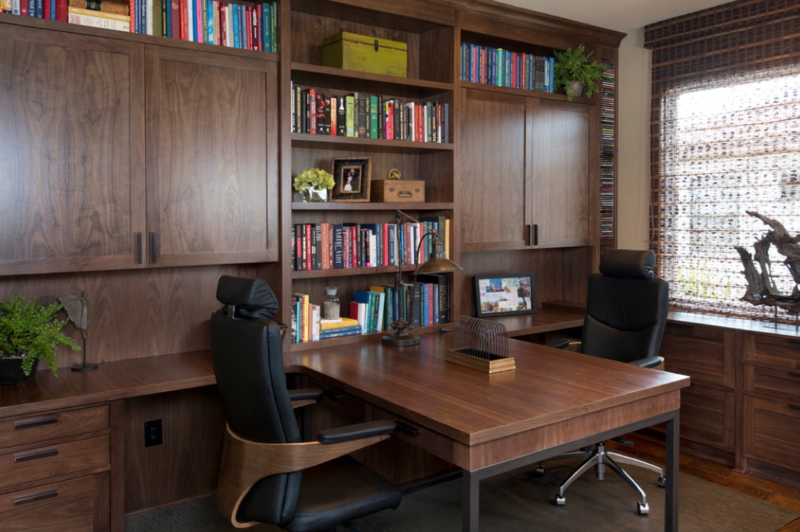 The side by side arrangement of these two work spaces leaves room for an entire wall of storage in the built in unit behind the chairs and the small space makes access to the files as convenient as turning around in the chair! The perfect way to put this kind of space to good use! This space takes all of the occupants’ favorite things that don’t seem to fit in with the decor in the main living area and brings them together in this basement office for two. The joy of being among items with sentimental value in a secluded and relaxing space away from distractions enhances concentration without breaking the budget! Check out Drummond House Plans’ complete collection of house plans with home offices in a variety of styles to suit every taste! These office space design are amazing. I personally love that one design with a caption using bookshelves to show off the library. I’m just staring to love reading books, and as a matter of fact I’ve been collecting books since I graduated from college, and by judging the amount of books I have, I think I really need to provide bookshelves for them in my own home office. I also love the contrasting colors of the wall. I’m a big fan of contrasting colors especially if the other color is part of dark hues. Overall, I’m impressed by these designs.